Single serving beauty from Masque Bar, Philosphy and MaskerAide! 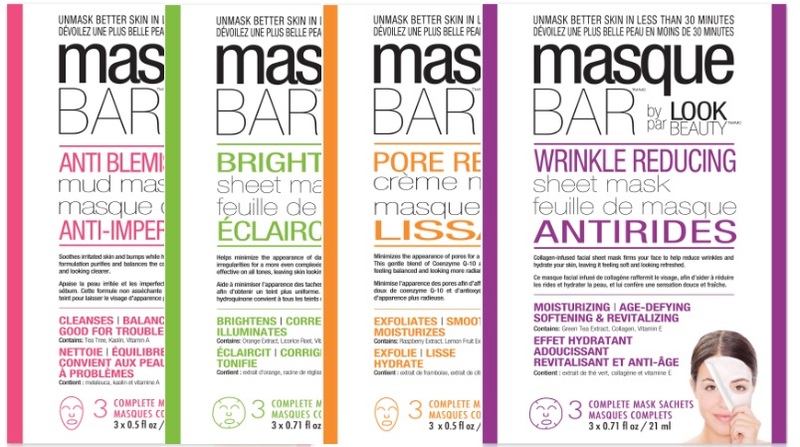 Masque Bar by Look Beauty - $9.99 pack of 3 - made with spa-quality ingredients to help treat everyday skin issues. Wear one for 30 minutes to maximize the unique blend of ingredients and unmask better skin. Wrinkle Reducing Sheet Mask - contains green tea extract, collagen and Vitamin E to moisturize, soften and revitalize skin. Brightening Sheet Mask - contains orange extract, licorice root and Vitamin C to brighten, correct and illuminate skin. Pore Refining Creme Mask - with a blend of coenzyme Q-10, raspberry and lemon extracts to help minimize pores while soothing the skin and leave skin feeling balanced and radiant. Anti Blemish Mud Mask - with oil-soaking properties to help minimize blemishes while replenishing essential nutrients that leaves skin feeling soft, smooth and balanced. The cream masks are an even better deal then you think, I got 3 masks out of one package of the Anti Blemish Mud Mask and after 3 days of masks, my skin looks clear and even and those nasty, bumpy visitors I had are a thing of the past! Available now exclusively at Shoppers Drug Mart and Phamaprix. Philosophy The Micro Exfoliating Triple-Acid Brightening Peel - 12 pads - $88 - features 12 individually-wrapped, pre-saturated chemical peel pads designed for weekly use to deliver advanced skin-brightening and anti-aging benefits. With a formula that contains mandelic, phytic and azelaic acids that dissolve and sweep away dead skin cells to help improve skin tone, reduce the appearance of fine lines and enhance skin clarity as well as skin-brightening technology that visibly reduces the appearance of dark spots and discolouration. Available at Sephora and select Hudson's Bay and Shoppers Drug Mart stores across Canada. Beauty Rest'ore - moisturizing and calming to ensure sweet dreams. I Don't Wanna Grow Up - helps to stop the early signs of aging. Weather Warrior - smoothes skin that has been stressed by the elements. All Nighter - perfect for those morning that you just can't wake up - my personal fave - it's an instant pick-me-up and erases the signs of a bad night's sleep or all those things you did the night before and now regret! Detox Diva - a powerful mix of antioxidants to cleanse and detoxify the skin. Pre Party Prep - preps your skin before a big night out. The masks are recyclable and biodegradable and even better for what they don't have in them including: parabens, dyes and pigments, mineral oils, artificial fragrances, benzophenones and glycerins. Find them online at www.maskeraide.com.